Well appointed Vermont Luxury Home. 4BR/3BA has everything you want in an ideal vacation property, open living area, Kitchen w/granite counters, large dining area, stone hearth fireplace, extra sleep area loft, screened porch, new hot tub, front deck, MBR w/bath, LL game room w/pool table, foosball & TV area + LL bedroom w/private bath & attached 2 car garage, 2 minutes to Jay Village, 7 minutes to Jay Peak Resort. Fully furnished turn key property! Interior Features Open living area, Kitchen w/granite counters, large dining area, wood burning stone hearth fireplace, MBR with MBA, extra sleep area loft, LL in-law suite, game room with pool table & foosball, 42" Flat screen TV, DVD, extra futon sleepers, all furnishings, pots, pans, plates, glasses, linens and towels included! 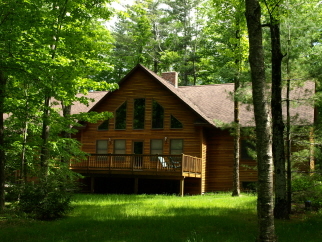 Exterior Features Hot tub, screened back deck, large front deck, gas grill, wooded parcel.